Santana was limited to just five starts in 2018 after undergoing surgery to his middle finger prior to the season. In his five starts in July and August, he was limited to 24 2/3 innings and did not earn Player of the Game honors in any of his appearances. Santana, 35, has since been granted free agency by the Twins. In 2017, Santana was ranked fourth among Box-Toppers’ most improved players. His 16.1 points in 2017 was a 12.1-point increase from his 4.0 points in 2016. Many players on the list of Box-Toppers’ “big dippers” also spent time on the disabled list in 2018, which was why their performance did not measure up to their 2017 success, including Strasburg. Dodgers pitcher Clayton Kershaw notably had the third-biggest decline of 15.8 points. He earned 8.0 Box-Toppers points in 2018 after earning 23.1 in 2017, when he ranked third among all players. Kershaw had a record seven straight seasons with 20 or more Box-Toppers points from 2011 to 2017, finishing first among all players in three seasons and finishing among the top three players in each of those seven seasons. Brewers pitcher Jimmy Nelson, who ranks fourth among Box-Toppers’ “big dippers,” missed the entire 2018 season with a shoulder injury. He earned 14.0 Box-Toppers points in 2017 and none in 2018, a 14.0-point drop. In 2017, Nelson was ranked seventh among Box-Toppers’ most improved players. His 14.0 points in 2017 was an 11.0-point increase from his 3.0 points in 2016. Giants pitcher Jeff Samardzija, who ranks fifth among Box-Toppers’ “big dippers,” missed substantial time with shoulder and pectoral injuries and was limited to 10 starts. He earned 11.0 Box-Toppers points in 2017, but none in 2018, an 11.0-point drop. Elvis Andrus of the Rangers had the biggest point decline among batters. His 10.0-point drop from 2017 to 2018 is the seventh-biggest among all players. He earned just 1.0 point in 2018 after earning 11.0 in 2017, which was third among American League batters. Andrus was limited to 97 games and was out for two months early in the season with a fractured elbow. Last year’s NL Most Valuable Player Giancarlo Stanton ranked 18th among “big dippers.” His 6.5 Box-Toppers points he earned in 2018 with the Yankees represented a 7.7-point drop from the 14.2 points he earned in 2017 with the Marlins. Stanton’s 14.2 points in 2017 was the fourth-best single-season total for any batter since 2012. Stanton ranked second among NL batters in Box-Toppers points in 2017. He ranked 11th among AL batters in 2018. There are seven players among Box-Toppers’ top 25 “big dippers” who also appeared on Box-Toppers’ 2017 top 25 list of most improved players. In a sense, many of these players had a one-year upward spike in points in 2017 that came back down to earth in 2018. Santana, who ranked fourth among 2017’s most improved players (with a 12.1-point rise to 16.1 Box-Toppers points), ranked first among 2018’s biggest decliners (with a 16.1-point decline to 0.0 points). Nelson, who ranked seventh among 2017’s most improved players (with an 11.0-point rise to 14.0 points), ranked fourth among 2018’s biggest decliners (with a 14.0-point decline to 0.0 points). Dodgers pitcher Alex Wood, who ranked second among 2017’s most improved players (with a 14.7-point rise to 15.7 points), ranked sixth among 2018’s biggest decliners (with a 10.7-point decline to 5.0 points). Diamondbacks pitcher Zack Greinke, who ranked eighth among 2017’s most improved players (with a 10.4-point rise to 20.1 points), ranked 22nd among 2018’s biggest decliners (with a 7.1-point decline to 13.0 points). Despite Greinke’s big decline, his 13.0 points in 2018 still ranked 10th among NL pitchers. Diamondbacks pitcher Robbie Ray, who ranked 12th among 2017’s most improved players (with an 9.3-point rise to 16.0 points), ranked 12th among 2018’s biggest decliners (with a 8.3-point decline to 7.7 points). Clayton Kershaw, who ranked third with a 15.1-point decline. Alex Wood, who ranked sixth with a 10.0-point decline. Cody Bellinger, who ranked ninth with an 8.7-point decline. In some years, the previous season’s leaders on Box-Toppers’ “big dippers” list will redeem themselves the following season, bounce back and even make Box-Toppers’ most improved players list in the following season. But 2017’s “big dippers” leader was pitcher Jose Fernandez, who died in September 2016. Fernandez earned 22.4 points in 2016 before being killed in a boating accident just prior to the end of the season. He finished third among all players in Box-Toppers points that year. His unavoidable 22.4-point decline in 2017 was biggest among all players. Batters took nine of the 25 spots on Box-Toppers’ “big dippers” list, which is more than the seven of 25 spots they had on the same list in 2017. It is also far more than the two spots batters held on the top 25 list of biggest gainers in Box-Toppers points from 2017 to 2018. Both players on that list were 2018 rookies (Ronald Acuna Jr. of the Braves and Shohei Ohtani of the Angels). And it should be noted that Ohtani earned half his Box-Toppers points while pitching. There were six players among Box-Toppers’ most improved players top 25 in 2017, which was down to two (or really, considering Ohtani, 1.5) in 2018. The decrease of batters on the most improved list and the increase of batters on the “big dipper” list is another indication of batters’ overall declining performance in recent years, a decline that became even more apparent in 2018. This season, for the first time ever, batters recorded more strikeouts (41,207) than hits (41,018). In Box-Toppers’ first season of player tracking, 1995, there were 25,425 strikeouts. That means there were 62 percent more strikeouts in 2018 than in 1995. Batters’ cumulative batting average has dipped from .271 in 1999 to .248 this year, an 8.5-percent drop. And batters are earning a smaller share of overall Box-Toppers points. From 1995 (when Box-Toppers tracking began) to 2009, batters earned about half or more of all Box-Toppers points awarded each season, including earning 56.91 percent of all points awarded in 2000. But in 2010 and after, batters fell below 50 percent, hovering closer to 40 percent of all points. This season, batters earned 39.32 percent of all points awarded, the second-lowest share for a season (behind the 39.14 percent share in 2014). Plus, only five batters earned 10 or more Box-Toppers points in 2018, tied for the fewest in any season (with 2014). From 1995 to 2009, anywhere from 16 to 28 batters each season would reach 10 Box-Toppers points. Since 2010, the range is five to 12 batters per season with 10 points. 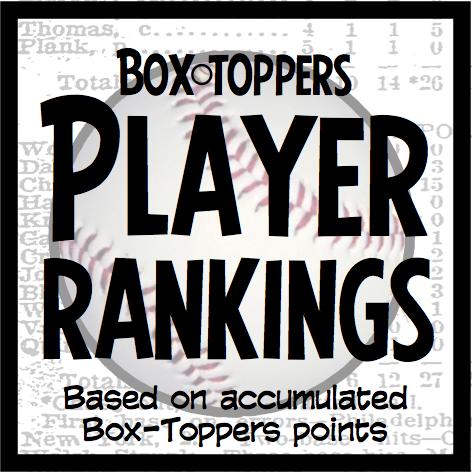 Moreover, top batters are posting lower Box-Toppers point totals. This year, batters leading both leagues in Box-Toppers points each had the second-lowest point total to lead their league batters in Box-Toppers’ 24-season history. And this year, for the first time in Box-Toppers’ 24 seasons, the two pitchers who led their league in Box-Toppers points both had twice as many points as the batters who led their leagues.